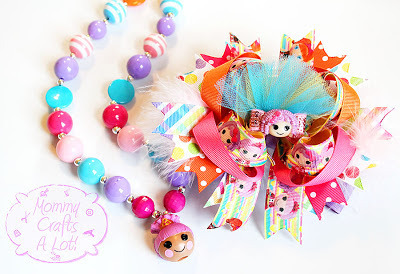 Hair bows move over.....make room for "Chunky Bubblegum Bead necklaces"! Ay Yi Yi, Like I needed a new addiction, right? I started buying beads months ago and never made a necklace. I said "I'm over beads!" I did. Just ask my friends :) I made a necklace. I made another. I made another....Well, you get the point! These bubblegum necklaces are really easy to make and they make great little photo props. **I let Kennedy wear her necklaces ONLY when I am around her at all times. The beads are small enough and it worries me regarding choking. Reagan wears the necklaces with no problem since she is older. I have even made myself a couple! You can find the jewelry wire, crimp beads and clasps/closures at your local craft store. If you need the beads try doing a search for "acrylic bubblegum beads" or "acrylic chunky bubblegum beads"
I also buy from many bead groups and bead destash groups on facebook. There should be a thread on my facebook page that was started not too long ago with a list of groups accepting members. 20mm and up is considered "chunky". I always work with 20mm and up. You can find a huge assortment of spacer beads and other findings on the Auntie's Beads website. Those are adorable! I just might have to make some! can you give more detail on the supplies? where do you buy your pendants? like the lalaloopsy one and the things like that? Best directions I ever got for anything, she made this chunky bead necklace tutorial very clear and it could even give you that boost of confidence you might need, it certainly sure helped my confidence. Thanks so much for clear and easy instructions. I love your necklaces! I've actually been making my own for a bit now - it's a new venture of mine - and I've purchased beads from several of the sites you mention below. I have been looking and looking for the pendants like you show, and I am having no luck in finding them! Could you point me in the right direction? I love your stuff - amazing work! what size are the spacers beads 4mm? These are great! I would love to make some for my daughter...but where do you find the resign character pendants? I want a bubblegum necklace. they look wonderful. it will go well with my dress. Where is the best place to buy beads wholesale? Where do you get the pendants from?? Where do you purchase the pendants? Ohhh!! thats really nice. I can't even imagine that anyone can use chewing gums for making decorative necklace. I really enjoyed reading these blog. I am going to buy Bulk Bubble Gum to try this at home. Keep posting new things like these. Cant find characted pendants. Help! Thank you for this!! Where do you find the character charms? What should I type when i'm searching? I'm making a friend's daughter a circus dress for her birthday and want to make her a circus necklace to go with! Love these! Where do you find the pendants? I love these! But where do you find the pendants? Where did you get the lalaloopsy head and other center pieces? I can't find any that stay forward facing or any that are anything like yours.?? These are so cute and my daughter would really like me to make her the one with the white pony with the pink, green and yellow hair, but I can't seem to find her anywhere. Where did you find that pony? If you wouldn't mind sharing. :) thank you! These are awesome! Thanks for the tutorial, but I was wondering where you found your charms? Where do you find your charms/pendants at? Where do you find your pendant/charms at for your bubblegum necklaces? Do you by chance know the names of your bead destash facebook groups, I would love to join! How many beads do you use for a child's size VS adult sized necklace? Hey would you mind mentioning where you got the lalaloopsy and my little ponies figurines? Do you make and sell ? Can you make and sell. If so please let me know. I have been looking for someone who can make these!!! Where do you find the character charms? Where do you find the character charms at? Did you ever post what size spacers you use? Thank you! Where do you find the pendants at? I'm trying to look for some in bulk, as wholesale since they're cheaper that way. I'm having a hard time trying to find the bubblegum beads in Canada...it's really strange! LOL I recently ordered some from the US but I paid almost 25 dollars in shipping! Aww! Love These. My Daughter Is Also Kenadee! Fun! My Daughter Is Also Kenadee :) She Loves These necklaces. ThankYou! Did you ever find out what size bead spacers you use? Thank you!! These are adorable! I'm going to use your tutorial to make my niece a necklace. One question- where do I find the pendants? I've checked Jo-Ann Fabric's and walmart. The links seem to be for the beads only. Any help or direction would be great. Thanks so much! Where do you find your charms? where do you find the character pendants, ive tried searching with no luck. Where oh where did you find the my little pony beads? My girls would go crazy for those! Stumbled upon this..love your necklaces! What size crimp beads do you use? and how long do you recommend making the necklaces? I went to hobby lobby today and couldn't find the beads! ;( I was disappointed! These necklaces are so adorable! So...do you sell these? They are gorgeous! Where do you buy the character charms? I can't find the cute cartoon pendants. Can you provide a link to those? Where do you find the character pieces? Where do you buy the cute pendent? what is your name on facebook so i can follow you? hi can you please help me find those adorable charms?? I have searched on eBay and etsy and I didn't find any maybe I am using the wrong key words? Can u please tell me if you have ever bought your beads from aliexpress and if so what ones have nice beads and prices. I want to make these for my granddaughters and would like to buy in bulk. Thank you. Hello! How big are the spacer beads you use? 5mm? 6mm?